Has anyone implemented and used or using "the secret weapon" gtd system that has been discussed on here? I've modified my method very slightly. I now have nested tags that help me ID projects. i.e. projectA	<---- the project tags. I like this because I can click on my tasks notebook (which contains my sub task notebooks "1-next", "2-later" etc and then click on a project, say "projectB" and see all the tasks for that project across the different priorities. I should also say that in my work, projects are more like areas of responsibility "scheduling", "hiring" etc. A key thing that I got from TSW though is zero inbox. I religiously clean out my email inbox. An email is either actionable now - quick reply, then archive, not actionable - then archive, or is a task - forward to EN, then archive. I should add that I've worked hard to minimize the number of tags that I put on stuff - in most cases most of my tasks just have one tag. Keeping it simple works for me. I started with Evernote and TSW in January of this year and like it very much for GTD. Around June of this year I stumbled on the private beta of Zendone and I am now totally hooked. Zendone is still in beta but it is very functional. You can request and invitation and they will set up an account for you. Basically, I forward all my emails to my default notebook in Evernote. That default notebook is tied to my "Zendone" account. In Zendone my Inbox shows everything that is in my Evernote default notebook. From Zendone I can make an item an "action" with due dates, etc. If it is not an action I send it back to Evernote for record keeping. It never really leaves Evernote, Zendone just uses some additional tags. Once an "action" is completed it leaves Zendone and remains only in Evernote. You can also create actions directly in Zendone. For me, most of my "actions" come from emails. Eventually it is my understanding that Zendone offer a premium account with a monthly fee, but right now it is free since it is still in beta. I would recommend that you go over to their website, www.zendone.com and check it out. When I am tagging a "when" tag, like "1-Now" or "1-Today" in my names, do I also tag it ".When"? I haven't been doing that but noticed when doing one via my iPhone it was listed as a tag and I guess in the desktop I didn't consider it its own tag, more of a header. I've tried Zendone (along with every other app!!!) and the problem that it has is that it is not a transparent two -way sync with evernote. For example, if you change a task in EN it doesn't transparently update in zendone in a predictable way. I think that they acknowledged this issue. For me, a true "GTD/Task manager" that uses EN as its back end must have a straightforward sync so that if I want to create or edit a task in EN (because that might be where I am at that point) I should be able to do so. Many of the apps that use EN just use it as a storage device which is fine as long as you only access via the app. Regarding tagging - I think you want to try and use as few as possible. This is because when you email a message to EN, you need to make it fast. Note that I use notebooks not tags to house my priorities. What I've found though is that you should try and live with your method and then tweak it after a while to make it better. Everyone has a different need and it isn't like adopting a GTD methodolgy requires a religious adherence to the concept. Finally - Gators are gonna chomp bama. Sorry about your Gators man - love playing them in Atlanta. How looks the list view on an Android Smartphone or Tablet PC? It looks ok, I just search by tags usually now that I'm using this tagging method. I've been implementing TSW for three weeks now and it has greatly organised my life. My ".When" tags are exactly the same as yours because I, too, would rather plan my tasks weekly. Just in case I need to specify a date for a task, I usually edit when the document was created. So when I click on "Date Created", it would automatically arrange the dates so that I can clearly see what tasks I need to follow up on. I've been using it about 2 weeks, I'm finding my 3-Soon box is a bit overloaded, but I did have around 1000 emails in my inbox I'm clearing out slowly.. I keep tweaking mine as I go - I just recently went a little hybrid on my initial setup of today, tomorrow etc... I found that I needed a list of things that needed done today or as soon as I can (ie now) - so I changed today to "1-Now" so I now see what is urgent to get done asap and then kept the others 2-This Week, 3-Next Week, etc... It's worked out great. Would really appreciate your feedback! That is a VERY good point. I am experiencing this and didn't think about this... I've been re tagging things from next week to this week and vice versa... I may try original way. The problem with being time related is you end up with too much to do and don't bother! Shame, there are plenty of Android users who would be intersted in this. Any chance of an Android version of EverDoIt ? I get what Gatorbrit's saying about the two-way sync. I know I'm probably in the minority on this, but I actually like the idea of only having Zendone as a "one-way sync" where I can only process my Evernotes and not try to edit them in Zendone. I'm running a dual test with IQTell and Zendone, and I like that Zendone is simpler. I know that I can file Evernotes in Zendone but not edit them. That allows me to know I only process my GTD system in Zendone and edit my Evernote information only in Evernote. I can definitely see why IQTell is appealing, and I can also see why The Secret Weapon is a good process. For me, I like how Zendone is just a good "just right" overlay for Evernote. I'm very interested to see how the iOS app comes out. As EACH note MUST have been one and only one ".When" tag, I found it easier to manage. gatorbrit, you can edit Evernotes content directly in ZenDone, or quickly open it from ZenDone to edt. Its done via the Evernote icon used with the listing of each item. What I dont like about ZenDone is that its ' context ' tags are independent from the Evernote Tags. It been pretty quiet on their part these days, in regard to updates and community postings, so I hope that does not indicate any problems with their future! In my view, any app that uses evernote as a background (like zendone), should allow me to fairly simply edit or create a task directly in EN and then have that show up in the app. Maybe this is not practical from a programming point of view, but I want that seamless two way interaction. Anyhow, I've tried ZD and I didn't really care for it. I am actually using omnifocus these days. Any suggestions on how to add recurring tasks - weekly, monthly, etc. to this system? Workaround: The way I have done my "6-Waiting" is that when I have a waiting (on a date) I preceed the entry with eg. "13-05-01"
Then I manually have to either search (notebook:@todo tag:6-Waiting tag:13-05-01) or just browse my "6-Waiting" category to the right date. Maybe this will be my (temp) solution with a new category "7-Recurring" and then when done the header will have to be changed to next recurring time. Hi, I have been using Evernote premium for about 18 months and TSW for the last 8 months or so. This has helped enormously as my partner and I run two businesses and are around 90% paperless, which I think is the limit realistically, as too many other people still insist on having the "original" or paper copies. and over 100 tags, the GTD works great, the search is so powerful that I can recall anything in less than a minute, for any client from either business. The to do lists for day, week and those all important Waiting for items, falls into place. Watch the TSW videos several times, I use Google rather than Outlook so, some refinement there, and take time to go through all your current notes. Once done, the system is superb..
@splodger1 You use Gmail web interface? How you forward the mails to EN? Simply forward them at all or do you use an extension like powerbot for that, or....? I use Gmail + TSW and do it this way. What this script allows me to do is process my Gmail inbox by labelling all emails I want forward to Evernote with the "Evernote" label I set up in gmail. I can label incoming emails manually or with Gmail filters. All these labelled emails are automatically sent to Evernote. I then archive all processed email in Gmail to arrive at zero inbox (without deleting the original emails). This script makes it really easy to get emails to Evernote just by applying a label to the emails you want forward. The real power happens when you set up filters to automatically send certain emails to EN. Want all your TPS reports automatically to be sent to EN? Set up the filter to apply the "Evernote" label to those emails and it's done. The only downside to this is that by sending a bunch of emails to evernote in bulk, you do not specify notebooks or tags in the email subject line. The emails will all end up in your default EN notebook and you must organize / move / tag them in EN. I have found this to be a very workable solution for Gmail users like me to use TSW. Gmail + Evernote + the TSW system (using the Getting Things Done methodology) has really changed my life! It uses the minimum number of tools (two! Gmail + Evernote) and as long as you work the system, nothing falls through the cracks. I watched the TSW videos a bunch of times and basically use their exact tag structure. It's awesome! Oooh... that looks slick! I'll have to give it a try when I have a moment to configure it. What is your experience with this script? It's working perfect... and the dev is also very friendly and fast on replies! I've been trying TSW with Evernote for the last month. Tasks which come in through GMail go to TSW, and I also add tasks by hand and through my Android phone. So far it's been easy to get stuff *into* Evernote, but I'm struggling with using Evernote as a task manager because the UI is getting in my way. A few simple UI improvements in the Evernote Web app would go a long way in supporting TSW. If I understand correctly, Everote 5 introduced some signifigant UI changes, and this makes it hard to learn and some of the methods described in TSW. I've found that the desktop app for the Mac looks and functions differently then what is shown in the videos. The lefthand sidebar is very different then what is shown in the video, and the default "Card View" is totally different. My work computer is a Mac, my home computers are Windows. The Evernote desktop UI is different on both Windows & Mac. I also have a Ubuntu workstation, and since there isn't an Evernote Desktop App for Ubuntu I use Evernote Web. But the Evernote Web UI is also different from the Windows & Mac Desktop applications, and I'm going a bit mad remembering all the little differences between the three different interfaces. Evernote will not sort by the 'Tags' column. A key point of the TSW tagging system ('1-Now', '2-Later') is that it's easy to sort by priority. But this cannot be done on Evernote Web. If I move a note from '3-Later' to '1-Now', the item now is now tagged with both tags. Removing the '3-Later' tag requires 4 clicks. If I'm reorganizing a dozen tasks all these clicks can get pretty tedious. Editing a task requires 2-3 clicks. The Evernote Web is pretty cramped on a typical laptop screen. The lefthand sidebar only shows 2/3 of the tags. I like using Evernote to store notes about everything and I *really* like decluttering all the "stuff" from my mind. However, every time I forward an item from GMail to Evernote I find myself thinking "Can't I just do this using Google tools? What does Evernote get me?" I want to use it, but I feel a bit like Evernote is the wrong tool for the job. I figure that some of this is simply part of the learning curve and perhaps I'm just not understanding how to use Evernote. But I also think that the UI on Evernote Web and Evernote for the Mac Desktop could use some UI changes. As a heavy user of GMail and Google Docs/Drive, using Evernote does add some complications even if it simplifies other parts of my mind. Evernote and Google's stuff definately has some overlap, and it can be confusing when deciding what tool to use. If Google does the right thing with Google Keep, then GMail, Google Drive, Google Keep, etc. could be as useful as Evernote. But for now I'm not sure Google will ever get there. I like to use If this then that to add recurring items to evernote. You can use the date/time trigger to trigger on specific intervals and add a note to evernote with specific tags/titles. Works well enough for me. anyone that wants to test the new EverDo.it for iPad - we will make the app soon free (with limitations, it will be a "trial" version). This will allow you to have the same tags in the task app (EverDo.it) and in Evernote (no changes). Right now we are adding a nice feature for reminders. iCal integration is done (so you can add time to your scheduled tasks like meetings, etc), you can add due date. I would say that this solves some of the issues raised in this discussion (like same tags in EverDo.it and Evernote), lack of Calendar integration, easy project / context view. Ability to change the name of a project in EverDo.it (this will automatically change the tag name in Evernote). We've been working really hard the last months. But we are proud. Our beta testers (well, most of them) are happy. But there are some people that suggest some improvements. And we are working on that. BTW, if anyone of you wants to join on the latest stage of beta - testing (well, for 1 week) of the iPad version, all of you are welcomed. Further all of the beta testers will be invited to iPhone beta tests (will start in 2-3 weeks) and web version test. I've promised 1 thing that is still in progress - the Android version. But it will come. For sure it will be available. As soon as the update and free version is available, I'll update you. It will be within the next 1,5 week (well, before the start of the Evernote DevCup - the 28th of June). Hello, just following up some previous comments. I've been using TSW for a year or so and really like it. I've just found IQTELL and am very impressed. Links excellently with email and evernote. Apart from one thing. If you "import" your evernotes as new actions it doesn't automatically load the same tags (1-Now @desk etc) to the new actionable task, you have to add them manually (from a list that it HAS copied over from evernote). ie if you have heavily committed to TSW (I have 200+ actionable items with multiple tags in evernote) it's not practical to shift em in and start full use of IQtell. Apart from this detail (which the very responsive people at IQTELL are working on) it looks like the gtd tool that, when worked alongside evernote, gives the closest match to FULL gtd. Anyone else got any views, comments? Of course I have. Try IQTell on Android or iPad. True, it's a very powerfull app, but I gave up. It's way too complicated for me. As you probably know, I'm professionally involved with SmartGtd app. It will be uploaded to iTunes this Friday. So during the weekend or next week it will be available. Further, we have applied to the Evernote DevCup 2013. Hope that you will give a test drive to our app and vote for us in the DevCup. Due to the DevCup we will also have a discounted price. I've been using Zendone (http://www.zendone.com/) since their early beta releases. It is out of beta and continues to fit well into my workflow. It syncs with Evernote and uses a specified folder (I use "@inbox") as the inbox for processing items per GTD. They also have an iOS app for iPhone which seems pretty good (I don't have an iPhone and can't give details on the app). I'd encourage you to check it out. Note: I'm just a happy user of Zendone and not a company shill! Two days ago I discovered "The Secret Weapon" and watched a few tutorial videos. This morning I discovered the website is down from China, where I am living now. Please confirm whether it's still up or down, so I can make a plan to get a VPN for secure access from Mainland China. Thanks very much. It was available again after 24 hours and I've downloaded all the video tutorials just in case. What an excellent website to check up time. The http://www.thesecretweapon.org website has been down for me for several days. Does anybody know if they moved to another site or if there is a place with the videos posted that can be downloaded? Thanks. Same question. Anyone have info. Thanks. Is it possible in Evernote to have tags automatically removed when you move Notes from Action Pending to Completed or Cabinet? I have created tags for every day of the month (1-31) and notes get tagged on when I have planned to work on an item or need to review again. This system has helped not let anything fall thru the cracks! I have a question about how you TSW'ers are using tags vs. notebooks. TSW requires every action note to have a .When tag. However, it also seems that an action cannot/should not have more than one of these .When tags. So isn't this the very definition of when you should really use a notebook? Seems like using Notebooks for 1-Now, 2-Next, etc would also make it easier to change priorities from any device (no need to delete the old priority). Opinions? There is no way to do this. One of the big problems with TSW is that changing priorities from 1-Now to 2-Next requires the cumbersome manipulation of tags. On Android this is particularly difficult. The behaviour for sorting tags is different on Mac and Windows, and Evernote Web doesn't allow you to sort by tags. You are right that a Notebook might solve this problem, but Notebooks can only be 1 level deep. TSW recommends a top level 'Tasks' and 'Cabinet' folder, and then an 'Action Pending' and 'Completed' folder under 'Tasks'. There is no more room for another layer of folders to designate priority. Some of the TSW workflows became harder to use with the introduction of Evernote 5. Among other changes, Evernote 5 deemphasizes the lefthand grey sidebar which is a key piece of TSW. On the Mac the sidebar no longer provides a way to easily move tags or create new tags, etc. Personally, I gave up on TSW and these UI incompatabilities are a major reason why. If you'll notice, the activity regarding TSW in this forum and on http://www.thesecretweapon.org/ have slowed down dramatically in the last couple of years, and the last couple of videos on http://www.thesecretweapon.org/ have said 'Coming soon' for about 18 months. While I'm happy that TSW works for the authors and I'm grateful that they provided the resources to create TSW, I imagine that the authors don't really have time to manage this not-for-profit venture, and I wonder if TSW was perhaps just a fad. When I first started with Evernote over 2 years ago I was told that 'Evernote is a note taking tool. It is not a task manager', and now I understand what they mean. I would recommend looking into another system. Perhaps Evernote 5 plays better with GTD-- I haven't had the time to look. Zendone looks like a nice tool, but at some point I just need to stop playing with new tools. I don't believe that I have to use a system exactly as written for it to be useful. I've been using Notebooks for my .When tags for a couple weeks now. Works really well, makes mobile easier. No downsides that I have found. I understand that Evernote was not really designed to manage tasks, but I have yet to find a better app for it. Evernote is ubiquitous, and also stores all of my reference material. Those two factors alone make it worth any hassles associated with administration of the system. I don't think TSW was a fad, any more than GTD. It's still good info and a very workable system. Too bad they haven't kept up with it though. @Norm3: why do you want to remove the tags when task is done? Just enjoy the results of your actions. Instead of using Actions Pending and Completed notebooks: There is another way to mark something done - you can use checkbox and check when task done. During the review you can search for notes with unchecked ones. This way you save the effort to move note from one notebook to another. @mruseless: there was a time I used notebook for priorities (1-Now, 2-This/Next week etc). After a while I realized it became more rigid then started to use tags again. Now I am a 'tag fan'. Sometimes the lazy one. During the week I sometimes realize that the priorities needs review. It means I have to move back a task from 'this week' to 'this month'. Removing tags and moving the priority back and forth are OK, but administration can be time consuming. So, I generated the following lazy ideology: this month includes this week and today too. Which means I can accept several tags for a task note. So when I move a task from 3-This month to 2-This/Next week or to 1-Now, I usually don't remove the 3-This month tag. Having 3 priority tag is not an issue to me anymore. I have a saved search for open tasks for this month, another for this week and another for today. When I make a weekly review I don't remove the old priority, just add the new priority to the task so it will show up in that one too. During the week's daily reviews I usually check my list for the actual week and choose the ones I want to do today. When I finish a task then the task note will not show up in any searches again and it does not matter how many priorities are still in it. In case I realize that the priorities need review and something has to moved to be done later, I just delete the 2-This/Next week tag. As it still has the 3-This month tag, I will still find the tag at the right priority. Maybe it is not perfect but helps reducing analysis-paralysis. Interesting approach with the multiple When tags. Thanks. When I finish a task then the task note will not show up in any searches again and it does not matter how many priorities are still in it. Didn't follow that. Why don't they show up? Do you remove the tag(s)? I have tasks in two notebooks: 'Actions Pending' and 'Completed'. When I complete a task, I simply move it to the 'Completed' notebook. My all saved searches make searches in the 'Actions Pending' notebook only. This way I don't have to remove any tag from the tasks completed and they don't show up in my search results. @matoatti: very interesting! When I was still using tags for When, I fell into that sort of by accident. I had many tasks that were both 6-Waiting and 1-Now, for example. These were often responses that I was waiting for but were also urgent. Your system seems like it would be very fast and efficient for daily work. However, I wonder how do you manage your weekly reviews? I prefer to look at one When category at a time. If I used a looser tag system as you described, I would keep seeing the same tasks over and over as I reviewed each category. In my professional role I have to lead several groups of people. In case of delegation to my staff, I tag the task with the name of the person and his/her supervisor. Team members are responsible to deliver on time. If there is a delay they have to highlight the delay in advance and ASAP. If they don't come to me for support then I know the task is on time and they will deliver. For these I usually pick up a few names every day with whom I am going to make a follow up. Follow up takes a few minutes and I usually make it during driving to my office by phone. Weekly review and the structure of my saved searches are key for me. Give me two days and I will share details. It is simplier then it might sound. -I usually use desktop version at my desk, iPad on meetings and at home and iPhone in car/town or when waiting for sg. I had an Android phone before, the structure was the same. - Tasks done are moved into the Completed folder without any additional changes or editing. That was the easiest for me. -I highly rely on my saved searches. For me it is easier/quicker to handle shortcuts compared to saved search. Searches used min 2-3x a week is in the Shortcuts. I don't put all searches to shortcuts as I like to see all shortcut on the screen. So searches I need once a week are only in saved searches. 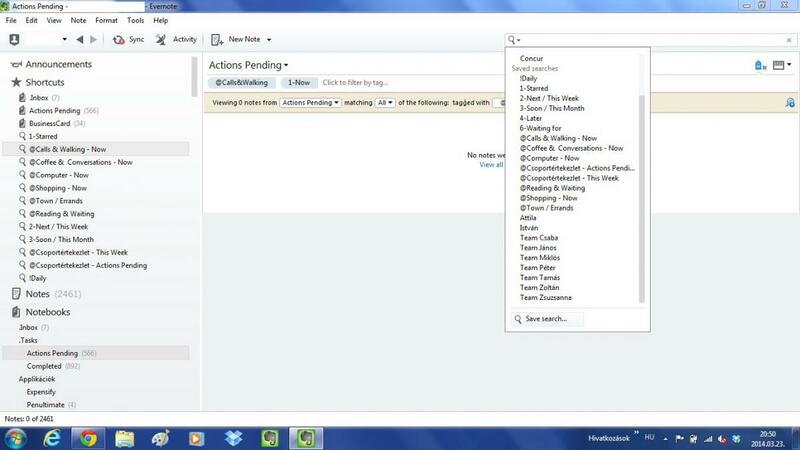 Saved searches are set to look for items only in 'Actions pending' notebook. -Repeated tasks are in my calendar or have Daily tag. -Delegated tasks are reviewed during team/project meetings. I have saved searches for these. Status of delegated tasks not reviewed on a given week are checked on Fridays. 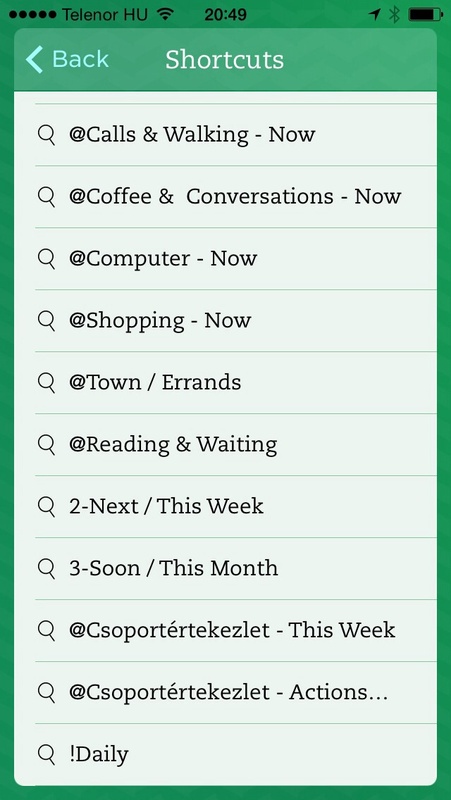 -I also have saved search for topics/tasks to discuss with my boss on the actual week. This is very useful to be prepared when I get a call from him. My weekly review takes 25-45 minutes a week. It was ~2 hours before but my life started to become easier when I reduced the number of tags and simplified my structure. It is done on Sunday evenings, sometimes on Fridays. -I don't review delegated tasks which were already reviewed during the week. -I don't make sandbagging or gold shining. A task finished is done. I recently prefer using my iPad or iPhone for weekly review. 4. Go to tasks having 5-Someday/Maybe & 4-Later tasks. If a task can be done this month, then it gets tag: 3-This month. This takes a few minutes and reviewed only during the weekly review. 5. Next step is to review 3- This month. All tasks to be done next week gets 2-This/Next week tag. (The previous when tag remains there. If priority changes later then I just remove the 2-This week tag.) These tasks are reviewed during the weekly review. 6. Review of 2-This/Next Week actions. Evaluate if list is feasible and when they can be done. Reviewed during weekly review and every morning and when the list of tasks for 1-Now becomes empty. 7. Choose tasks to be done 1-Now. This tag is given for tasks to be done today. 8. Check if all 1-Now has a where tag. I have a saved search listing all 1-Now in Actions Pending for this check. These show me what I shall do depending on where I am. Shortcuts are very useful during my day. One of my friend uses one notebook for tasks. I will ask him what his trick is. Your weekly review process is very similar to mine, and you have a few things in there that I may try, like your "Where" contexts. I don't have very many, only @work, @home, and @Errands. I've been thinking about contexts lately and they don't seem to make sense for the way I work. I've been considering a change to more energy and time based "Where" contexts, although I do find it helpful to separate home and work tasks. How many tasks do you have? I have only about 250 which isn't too bad, but even then it would be cumbersome to review the same task 3 times if it were in 1-Today, 2-ThisWeek, and 3-ThisMonth categories. Do you find this is a problem? Actually I have 607 tasks, including those which are waiting for someone. I have roughly 70 tasks I want to do myself this month. I usually manage to clear the 1-Today every day and only a few remains in the 2-This week when I make a review. So it is not too bad, as most of the tasks are in the category 3,4 or 5. After selecting what I put into 2-This Week, I usually realize that I want to overallocate myself without any margin. Between the weekly reviews I usually check 2-ThisWeek only and during the days I only check 1-Today category together with the context. I usually make 3-4 calls in the morning, kill 2-3 tasks at my computer then visit my colleagues or go to meetings to discuss specific topics. And I never miss any topic I wanted to discuss. During my days I usually see 2-5 tasks at a time depending on the context and it does not overhelm me. It is always an awesome feeling to mark sg as complete and gives extra energy for the rest of the day. It also gives me some margin for the urgent tasks. Sometimes I finish only 5 tasks a day, sometimes more than 20. Any time a task is added, he places a checkbox to the first row. If a note includes several tasks, he puts a checkbox to every task in the note. @Context is also used as tags. When a task is done, he simply checks the checkbox. When he is looking for a task, he has saved search also to look for tasks in the ToDo notebook with the specific context and for pending tasks. I think he has a slightly simplier system compared to what I actually have. The thing is, I'm still very confused about how to use TSW on mobile. I really have no idea! It's hard to filter by tag on mobile. OK, if you are interested then I can make a quick guide how to set up a lean and handy system. It will work on both iOS and Android phones. Hi Matoatti, I would like to say yes! BTW, I sent Braintoniq a message the other day enquiring if they still use Evernote and TSW and their Director of Operations and International Sales was kind enough to reply in the affirmative! For the record I am an avid Android/ Google fan. Yes please! That would be amazing. Another question - when a task is completed, do you remove the tags from it? Because if you don't and you only put it in a "Completed" notebook, then the notes still come up when you find notes that are tagged "1-Today", for example. Edit: Another thing I'd like to add - I don't use evernote just for tasks and lists (the way it's used in the videos of TSW). I use it for everything. OK, I will share next weekend. @SahilC: I never remove the tags, simply move task to Completed folder. When I look for tasks they never show up as I search tasks in Action pending folder only. I also use Evernote for everything. 1. How do you manage due dates? 2. How do you get priorities in tasks? If you have tons of notes in "Today", how would you decide what to do next, or what's most important? I LOVE the brain dump part of evernote. I just dump my thought, and process later. The actual task management is an issue for me. What about projects? I haven't solved it with TSW yet. I usually create a Note for a project (like "Buying a car"), and inside I use checkbox for tasks (and I add the estimated time to complete each) and put ALL the information (even PDF files) about this project. Then I tag it with @Work or @Personal, and 1-Now, 2-Next or 6-Waiting, depending on if I have a task to do on it today, if it has a Next action defined, or 6 if I'm waiting for something to move on this project. What really bugs me is that I usually find 65 notes, but I now there are a lot more tasks because each project has tasks inside. I have spent years trying to get myself on some sort of time management system. I have gone through multiple day planners, and nothing, at least with paper, ever worked for me. Years ago I ran into GTD, and it made a lot of sense, and that was the last time I tried to implement a paper planning system. I still have all the folders, but never implemented the system. My issue is that paper really doesn't do it for me. Trying to carry around a planner, and checking it all the time, going through files and folders to manage my time, I just never could do it. But I first started finding success with setting alarms on my watch, then getting one of those telememo-databank watches. (That might date me a little.) Once I had a phone with a calendar and alarm, I found I quit wearing a watch. I started using Evernote less then a year ago, but never really got it implemented properly. Then the connection between GTD and Evernote was presented to me, though I didn't like that system, so I looked around, and found TSW. I am still fairly new to it all, but it seems to be what I was looking for. I still need to work with it to make it mine, and even now I am searching to find out if there is anything I can add, or some way I can modify it to make it better for me. I have found that setting things up on the website, using my desktop has worked the best. And I saved searches for all the numbered tags, and named them for those tags. Then on my iPhone or tablet I simply tap the search icon, and select the tag, such as !Daily, or 1-Now, and it immediately gives me what I need. While Evernote does have an alarm, anytime I have anything with a specific time associated with it, that goes in my Calendar, and only will go into Evernote if I really need some sort of notes or record of the event. I first check my calendar, then !Daily, then 1-Now. Then if I feel like it, I will move to 2-Soon. For projects, I do what is called chunking. Instead of using a list, I break it down into logical groups, and each note takes that logical group, but I try not to have anything that will take more then a day in one note if I can help it. Each note may have a list, but I shortened list, mostly of associated tasks that are done in order, often quickly. I will number the notes 10, 20, 30 to keep them in order. The reason for going 10 at a time is if I need to add a note somewhere in the middle, I won't have to re-number everything. (Stolen idea from programming.) Also if for some reason only part of today's list didn't get done, I will simply create a shortened list of what didn't get done. This project is given a tag so I can look up just the list of that project. Obviously those tags can be used again for similar projects because the old finished projects won't be in the same notebook. I might make a saved search for that specific project, then delete it when the project has completed, unless I will create a new project using the same tag after the first is done. I noticed one person mentioned the lack of a tickler filing system, and another mentioned the tagging to create it. But one of the videos on the TSW's site lists sorting based on time, and mentioned that the time created could be changed to whatever you wanted, so it automatically makes a kind of tickler file. I haven't used this though, haven't needed to yet, so I am not sure how well this works. Also I am still learning how to search multiple tags in a notebook on a mobile device. Right now I am only creating and saving searches on my desktop, and using them on the mobile devices, but I want to keep this to a minimum. Recently I started looking into the If This Then That website. (ifttt.com) This site allows a person to create a "recipie" where actions cause automatic events. Such as tagging a YouTube video for later results in that video being added to a list in Evernote. They have thousands of pre-existing recipes, many for Evernote. I believe you can set it up to automatically foreword all sent email to Evernote. I just discovered this, but I am very interested in it. Lifehack has an article on 35 recipies for it. Here's a YouTube video talking about it. I have a feeling this is going to be a powerful tool to add to this system. I created a new ".when" tag that is quite useful to me; this "7-WhenMeeting". I used it for something to tell to somebody when I meet him. It does not need to be done "1-Now" or "2-Next", etc. but just when I meet the person. Then, when I am up to meet the person, as part of preparing the meeting, I select the tag with the name of the person and "7-WhenMeeting" and I get all the subjects I need to cope with during the meeting. In the past, I was often frustrated after a meeting because I forgot to tell something important. Now it belongs to the past. As soon as I have something in mind to tell to somebody for a next meeting, I just drop it in Evernote with the tag with her/his name and ... "7-WhenMeeting". >Also I am still learning how to search multiple tags in a notebook on a mobile device. Right now I am only creating and saving searches on my desktop, and using them on the mobile devices, but I want to keep this to a minimum. You are right – the desktop is the tool of choice for your time management in Evernote. Saved searches can be useful for your tablet – for example, see all the "Now" items for "Project XYZ". It's doable, but a bit of a fiddle. There is some coverage of projects in their forum. Then I give each task relating to a project its project tag, as well as an urgency/importance tag - Today, This Week, Soon, Later, etc. good to see this thread there. I just upgraded to Evernote Business & curious if any here has played around with a "team TSW" implementation? a gripe I currently have is tags aren't stackable in EB so curious what others have done to keep their tags organized? Are you saying that by upgrading to EN Business, you lose the ability to stack tags? Isn't that a step backwards? "I have gone back to using the standard version for now, however I did note that adding the tags in the note worked, however you cannot stack you tags in the business edition which kind-a sux!" Cannot find anything more recent, but it's worth checking with support to see if this is still the case. No stacking of tags would be a deal-breaker for me, too. hey i need to make a clarification: if you upgrade to Evernote Business, it is your business notebooks that don't have stackable tags. your TSW implementation in your personal notebooks will be unaffected. You will still be able to stack tags. what I was inquiring about is whether anyone has played around with the idea of "team GTD" or "team TSW" using Evernote Business. @Malc: I can confirm today's version of Evernote Business does not stack tags. while don't quote me, the reason was if the 10 of us were on the same team, we'd probably all want to stack tags differently. thus, it was easy to create a tag, have your buddy stack it somewhere and have no idea where it went. so until Evernote comes up with a clever way for us to take same set of 100 tags and stack them differently for the same business, no stacking! please join there if it's convenient or if you guys are happy to talk about TSW for Evernote Business here, i don't mind either. I'm just experimenting with it so even my input will be limited. Hi Chinarut - So it sounds as if a "Secret Weapon" type of tag structure using a personal installation would be okay. Cool. I tend to avoid stacked notes anyway largely because they can stay invisible so easily in Evernote. If a tag is at the top level I can find it alphabetically. But if it's a sub tag then, on the occasions I've tried to find one that's well hidden, I haven't found any way Evernote will allow me to pinpoint where the sub tag is. It would be good if anybody knows a way. Good luck with Evernote Business. i assume you mean "stacked tags" - this is the exact reason I'm hearing why Evernote decided not to stack tags in EB - the issue is compounded when you have multiple users sharing tags. I'd like to hear some good alternatives anyone has found too - I'll be reevaluating my tags quite soon and it's the exact reason I purposely keep my use of business tags quite light. Yes, I suppose they are stacked tags. I usually use the term sub-tags as it seems more intuitive to me. The thing is, you'd think it wouldn't be that hard for Evernote to let you search the tag tree in the Left Panel and then let the search plonk you right onto the tag you have searched for - right in the Left Panel. That would be really handy. But I suppose either it's harder than I think, or maybe not many people want that feature. It's not a major hassle and it's largely overcome by not stacking tags. I agree that less is more – my advice to people is to use as few tags as you can get away with. One of my regular jobs is to check my tags for any that only have one or two notes in them, and try to get rid of them. On the topic of "tag maintenance", when discovered The Secret Weapon and started using Evernote for time management, I had hundreds of tags. I bit the bullet and deleted all of them. It felt very bold at the time... but I never looked back. Since then have been very careful about the new tags I create. I'm also more careful about making sure keywords I might search on later are within notes, which sometimes saves tagging. I prefer how things are sorted on my Macbook. Any thoughts on how to tweak things on my Windows desktop to make it sort like my Macbook? Is this what you get when If you are in List view in Windows and you click the Tags column for the sort? If so I don't think you should be getting the sort that you reference above. Are there any other tags in the notes? I have a similar set up in Windows but I precede the when tags with an !, !1-Now for example. The ! tags sort to the front of the tag list. If I do a tag:! * search and sort by tags, I get what it you get on the Macbook. FWIW. Surely Nomnom54 just has to click on the header in the Tags column to sort the tags....? Yup, if those are the only tags in the notes in question. I *just* started using Evernote and TSW for GTD, but I found a neat thing that I use for projects. Unintuitively, I start by defining all the steps in a project. Once I have a note for each step, I select them all, then click "create Table of Contents note". This generates a note containing a numbered list of all the notes I selected, with links to the notes. Then I select the whole text, click on the numbered list icon to remove it, then click the checkbox icon. Voila, now I have a list of notes with checkmarks for all of them. If I find that I'm missing a step on a project, I just have to create the note for the extra step, right click it, choose "copy note link" and then go to the ToC note and paste it in the appropriate place. Here are my notebook lists and those help to me much for GTD. I discovered GTD but also TSW a month or so ago and now have 60 notes (for now) and I start to see some results in efficiency as well as in stress reduction for my project management work and personnal life/responsibilities. I just wanted to share with you my tags since they might give you ideas on how to arrange them. When I create a note I make sure I find tags starting with 1, 2 and 3 at least. Now looking for your feedback and ideas ! Any feedback ? I tried to take the best from your posts, but I happen to think it is just a bit too complex. I do not use the 5- tags very often so I might just delete them. Hard to say too much, B1G - it's what works for you and trial and error. There's not much I can see there that obviously needs tweaking. I can't see "Waiting for", or "Pending" as I call that tag. The What tags look OK, 2 x Now tags looks too much: but maybe that works for you. What are you finding is not working in your system?